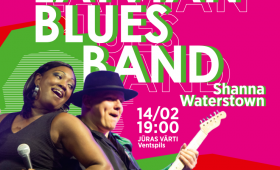 The charming American blues singer Shanna Waterstown and Latvian Blues Band will perform at the theatre house “Jūras vārti” on February 14 at 19:00. Musicians have performed together at various events both in Latvia and abroad already for several times. In the program the visitors can await blues compositions known throughout the world and composed by artists themselves.